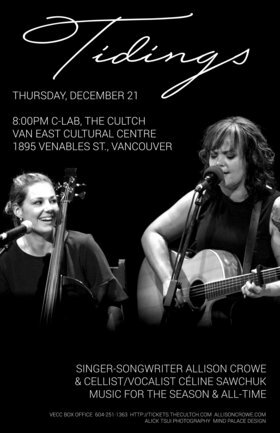 Presented by: Rubenesque Records Ltd.
Canada's amazing Allison Crowe (vocals, piano, guitar), Vancouver Island-born, Newfoundland-nested singer-songwriter, pairs with exquisite cellist/vocalist Celine Sawchuk, born in Germany's Black Forest and now home on Salt Spring Island, BC to bring “Tidings” – music for the season & all-time. Tidings delivers comforts and joys – stirring together traditional Christmas and holiday favourites from English, French and German repertoire, with an organic blend of rock, jazz, folk, roots and soul. Uniting a range of rich cultural traditions, Allison and Céline deliver musical joy and wonderment this holiday season in the acoustic embrace of the C-Lab. Allison Crowe’s original tunes are sung by the chimney, together with gifts from the modern canon of Joni Mitchell, Leonard Cohen, The Beatles and Patty Griffin. The pair’s sleighful of traditionals and classics is bound to feature selections from such favourites as “Silent Night”, “La Vie en Rose”, “Es ist ein ros Entsprungen”, “Soul Cake”, “Wexford Carol”, “In the Bleak Midwinter” and plenty more delights – perhaps even a plum from Broadway! Wishing you Joy, Peace & the Very Best of Health and Times!